Firefighters worked to put out a fire in a shredder at PSC Metals in Knoxville, TN. 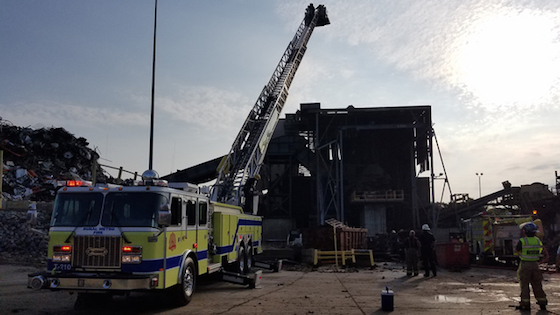 All workers were able to evacuate a fire that broke out at PSC Metals on North National Drive in Knoxville, TN, Friday morning after a shredder caught fire, officials said. The shredder is used to take cars and shred them into fine particles, said Rural Metro Fire spokesman Jeff Bagwell. However, if there is a battery or fuel tank with fuel still inside, a fire can ignite. Bagwell said conveyor belts and electrical lines were damaged, but no injuries were reported in the incident. Rural Metro fire crews were able to extinguish the fire on the second level.